In case I haven’t told you yet, I LOVE pumpkins! All colors, real ones, fake ones, paper ones, fabric ones… well, you get the picture! 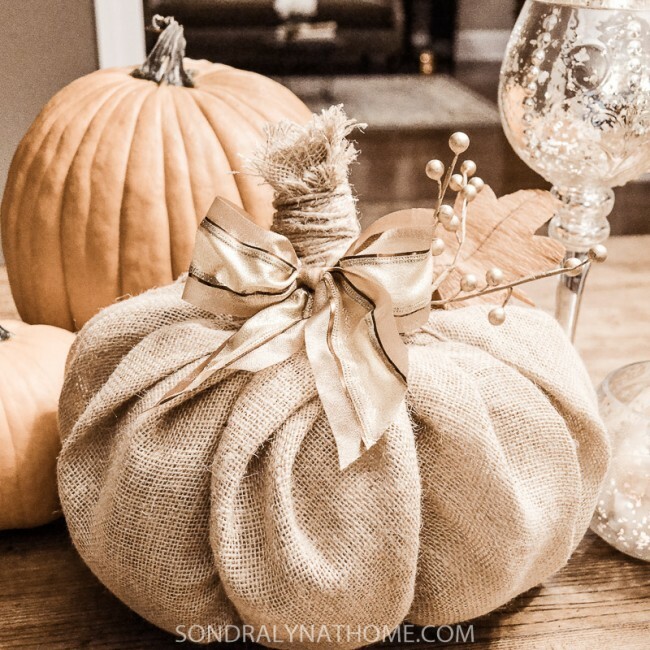 I was thinking the other day that I would like to create a pumpkin craft, and decided to make a burlap pumpkin. Plastic grocery bags! Oh, my goodness. Eureka!! I haven’t switched to a fabric shopping bag yet, so we still get them… and while I try to recycle them, you can see my little bag holder is overflowing! It’s exactly what I was looking for. 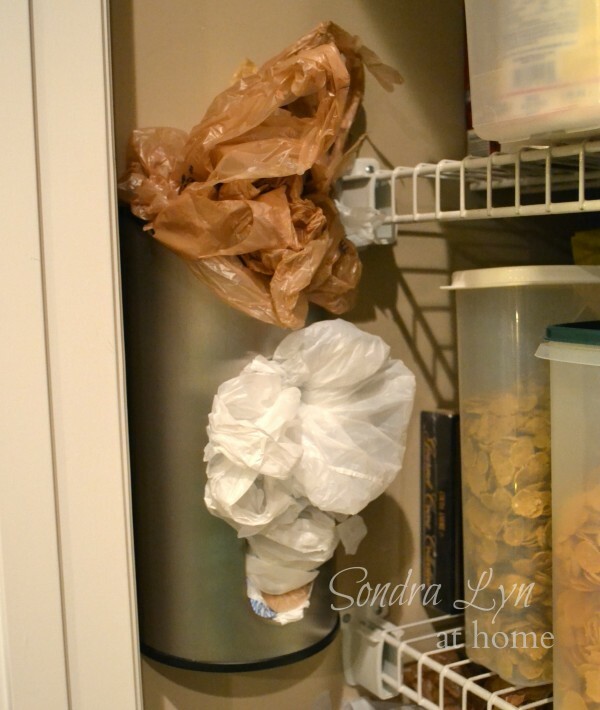 grocery bags… lots of them! Square up your yard of burlap (it will probably be wider that 36″). Find the center of the piece of burlap using the HINT at the end of the post. Round the corners, creating a 36″ diameter circle. Cut 4 lengths of twine at 48″ each. Lay them out symmetrically on the back side of the burlap. 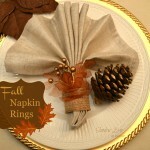 From a scrap, cut out a small 2″ circle or square of burlap. Where the twine joins in the center, hot glue the small piece to secure all the lengths of twine. 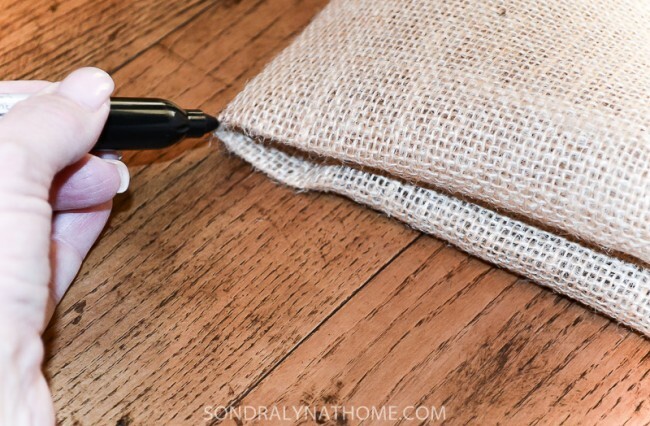 *Make sure you have something underneath the burlap because the glue will go right through to the surface beneath!! This will be the bottom of your pumpkin. In order to provide weight and keep your pumpkin upright, you want to fill a zip-lock bag with rocks or pinto beans, or something like that. 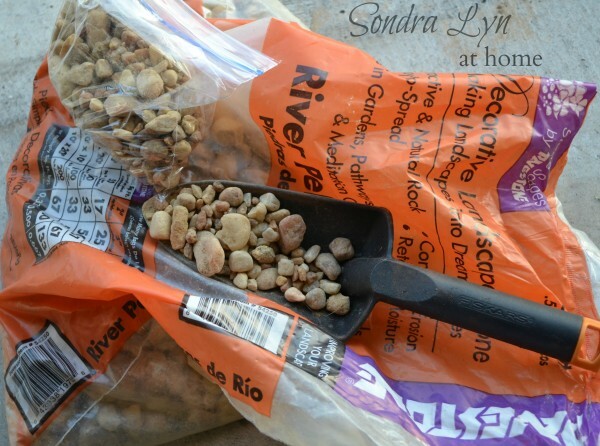 I just happened to have a bag of river rock on hand! Assemble the stuffing: I chose to double bag, and use the natural color bags for the outside so if you get a glimpse of the bag through the burlap it won’t be white (I also turned the bag inside out, so the store logo wouldn’t be so dark). Place your bag of rocks, etc. in first and then just stuff it full of the plastic bags!! Keep stuffing until it’s stuffed pretty tight. Tie the bags at the top. 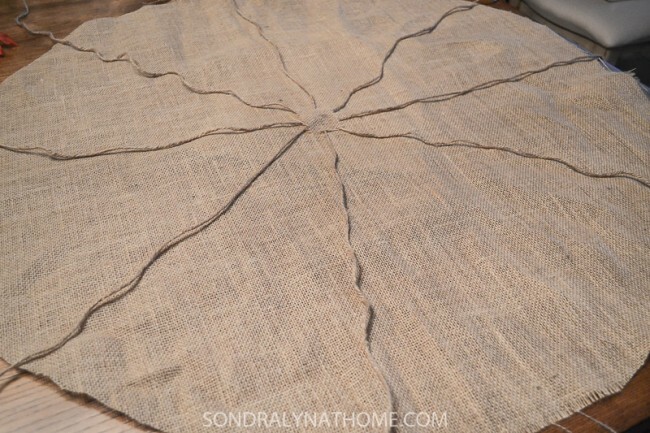 Flip your burlap circle so that the twine is on the underside. Place filled bag on top of your burlap circle. Pull up on all sides, gathering up all the ends until the burlap circle is completely cinched up. Then, from underneath, keeping the twine lined up the way you laid it out, bring each piece of twine up on opposite sides and tie off tightly, creating the ribs of the pumpkin. Take another length of twine and tie around tightly. I managed to do this by myself, but if you want it cinched really tight, you can have someone hold while you tie, or vice versa. After tying off, you will have several long pieces of twine at the top. 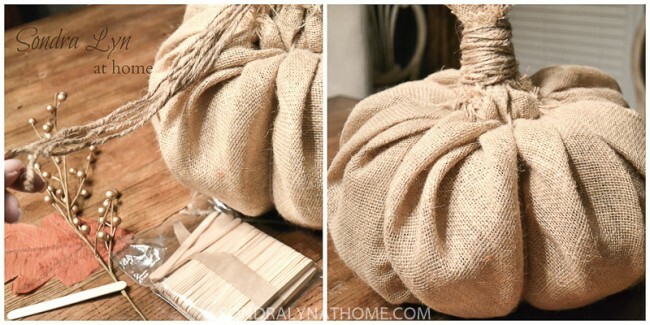 Scrunch the burlap up and wrap the twine around to make the stem! (Hot glue the twine as you wrap to make the stem). Now, just add any embellishments that you might have on hand! I already had the ribbon and the berries stem. I purchased a pack of 10 leaves earlier at the dollar store… so that leaf cost a whole dime! All I had to buy for this project was 1 yard of burlap for 3.99/yd!! This project came in at under 5 bucks! Tell me what you think… is she a beauty or what? Do you like to work with burlap? What are some of your favorite fall projects?? I hope you’ll try your own burlap pumpkin! HINT: To find the center of any piece of fabric, fold in half, then half again. The corner of all the folds is the center! So adorable! Love the look of this! Thanks so much, Jenna! It was SO easy and ‘thrifty’ (it was hard not to use the word ‘cheap’)! Thanks for reading and for leaving a comment!! I had no idea burlap could be so pretty! Love this! Stopping by from Best of the Weekend! This is so cute. These would look so good as centerpieces for the Elks Harvest Moon Ball. Love your blog! Thanks so much, Melody! And thanks for reading!! Thank you, Kim! I’m actually not a big fan of it either… while I love its texture, the thing I don’t like is that it sheds. Not a fan of anything that creates more dust in my house than I already have! 😉 Thanks for following… I’ll return the favor, if I’m not already following you! I am just trying to grow- still a ‘baby’ blog. 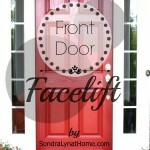 This looks great, Sondra! Great tutorial, too. Thank you SO much, Marty! It was such a fun and easy project! Love your blog!! Your pumpkin is so cute and I love how you have it arranged with the real pumpkins and candles. Very pretty. Stopping by from the Weekend Retreat. Thanks for stopping by! Hope you’ll visit again!! Oh my gosh I love this pumpkin so much! It’s so cute! Pinning it, and thanks so much for sharing at my link party! Thank YOU, Jessi! 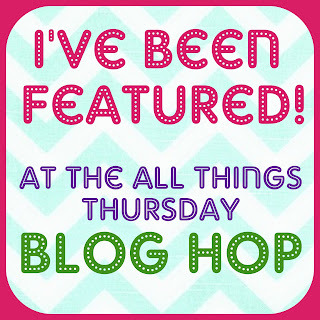 You probably saw that my blog is still a baby… I really appreciate the sharing ops! Come visit any time!! Thank you SO much, Peggy! Have fun!! What a great pumpkin! You did a wonderful job with it. I’m a new follower and look forward to more of your creativity. Pat, thank you so much for following!! I just love fall, don’t you? Yes, we totally ARE kindred spirits! 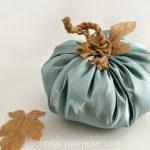 I love that we both tackled burlap pumpkins using things we already had lying around the house! 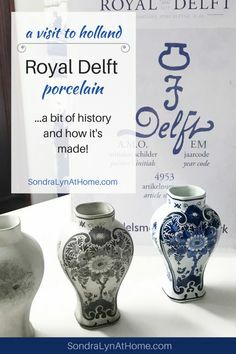 Yours turned out beautifully – – super chic! Thanks for your sweet comment and the invitation to stop by. Feeling inspired! Thanks, Lauren! I wanted to use the burlap from Haven… but it was actually too thick! I made a fairly large pumpkin and there was just too much bulk to twist into the stem! So I had to buy some that was a little lighter weight. I LOVE your blog!! 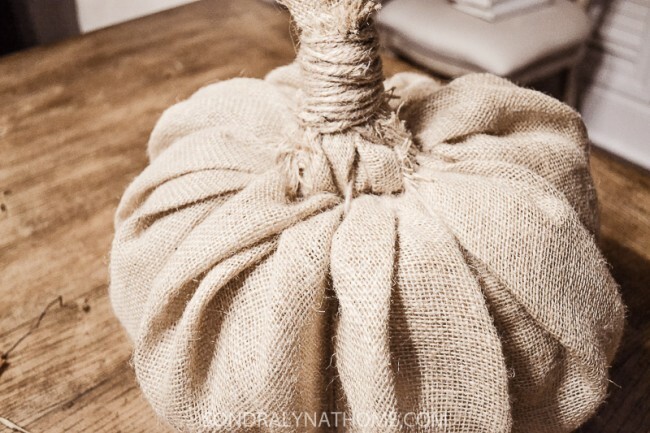 I have seen a lot of burlap pumpkin tutorials and this one is the easiest and best looking. I love it! It has a different look which is so appealing! Visiting from Marvelous Mondays and following you! Pinned! Thanks a million, AnnMarie!! You really can’t mess this one up! Just keep working with it till it looks good… Thanks for the Pin! Super duper cute!! Thanks so much for linking up at Inspiration Monday! Featured these on my Facebook page. Have a fabulous week! Thank you, Kristi! I’m still in the growing stage… so your support is greatly appreciated!! And I LOVE your blog name: shouldn’t we ALL be?? 😉 I’ll be sure to like your FB page! Come share, too, if you can. Thanks so much, Linda! And… I did!! There were some awesome links! Sondra, you are so creative, really cute pumpkin! I didn’t know that you were at home with Larry now! Hope you “2” enjoy retirement together, looks like you have a neat thing going for you. You will do great I’m sure. Thank you, Agnes!! So glad you are reading! We are enjoying this time in our lives right now… especially our little grandson! Hope you are well! 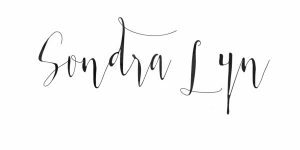 Hi Sondra Lyn! 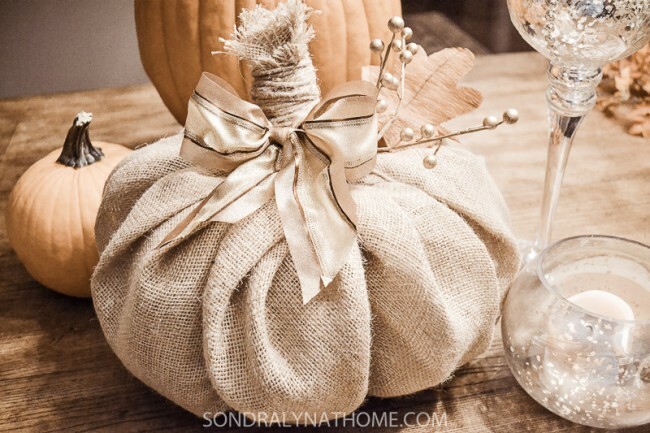 I absolutely love pumpkins too and love your burlap pumpkin! Thank you so much for sharing and joining us at Best of the Weekend! Pinning! Hope you have a wonderful first week of autumn and that you can join us again this Friday. Happy Monday! I love it. 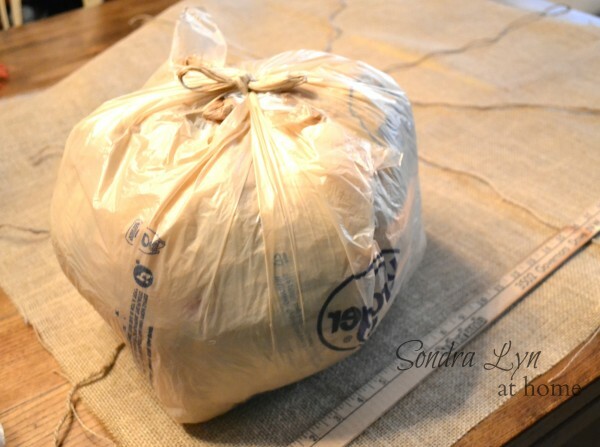 I have way too many grocery bags and this will be a beautiful project to use them up and get ready for fall decorating! What gorgeous pumpkins! Great tutorial. Thank you soooo much!! Sorry for the delayed reply… I had been out of town (and out of internet access, too!). Hope you’ll visit again soon. Very cool. 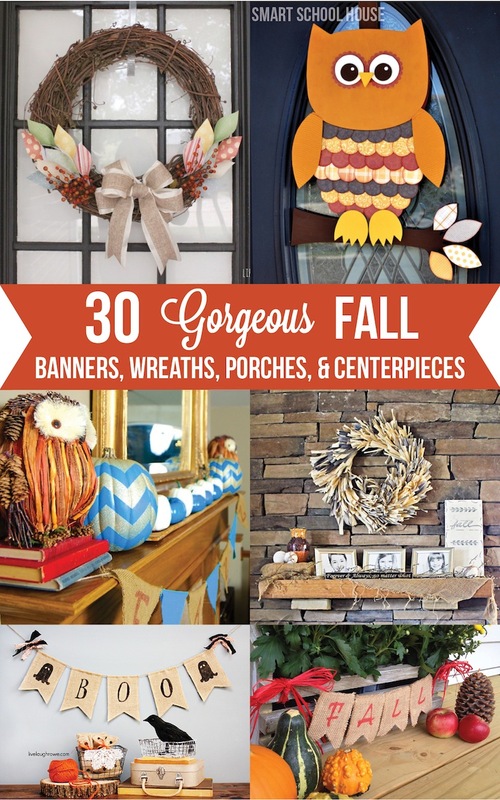 What a great way to make some fall décor for the house. Thank you so very much for visiting! Hope you’ll come back again!! Thanks, Katie! I would love to… I’ll visit your site and link up! Hope you’ll visit again!! What a great idea! 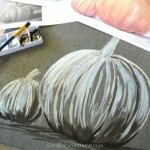 I have seen lots of tutorials for fabric pumpkins and this is by far the easiest. Thank you for sharing! Thanks, Julianne! So glad you stopped by to visit!! I’ll be sure to pay your page a visit. Blessings to you! Very resourceful! 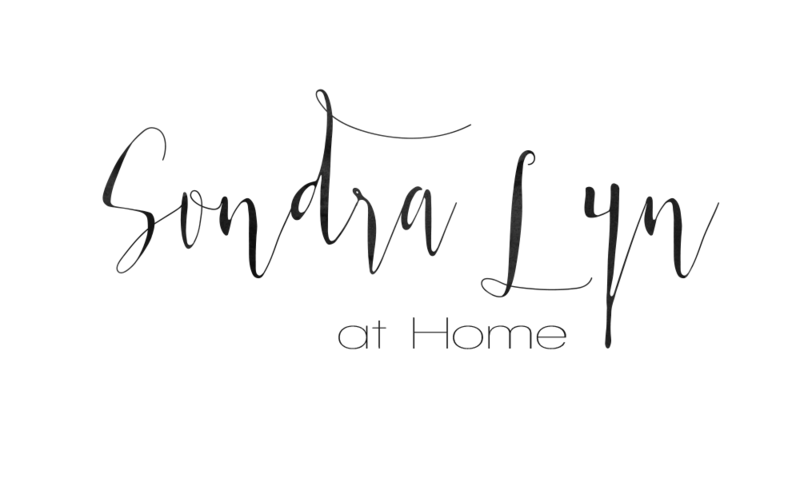 Thanks for linking at my Pin Me Party! I just love this pumpkin! I am a big fan of the burlap and the fact that you used plastic bags for the filling. I am always looking for cute things to make from burlap. Thanks so much for linking this to the In and Out of the Kitchen link party. I will be featuring this at the Top 10 Features post that goes live on Monday morning. Thank you SO much, Cynthia!! 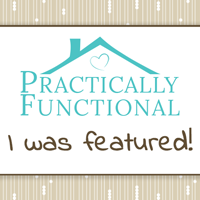 It was truly a pleasure to be featured on your post!! This is a very clever and beautiful idea. Congratulations on being spotlighted at Inspire Me Monday. Blessings! Love it. I am not very crafty but I am going today to get burlap and twine to make this. Wish me luck!! Thanks for visiting my blog, Sue! Have fun making your pumpkins!! 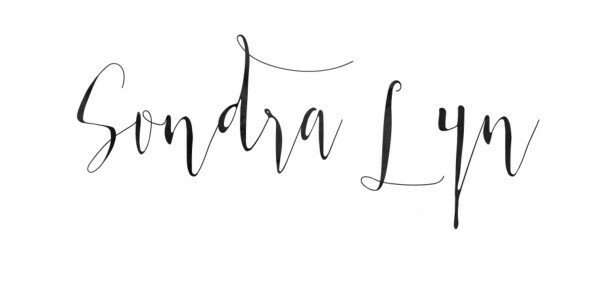 I love this, Sondra! Featuring you at Work It Wednesday this morning!! Thank you, Laura!! I am honored! so how big does this pumpkin turn out to be. a yard of burlap is a fairly a large piece. I am interested in smaller pumpkins and wondering how to downsize. I love your burlap pumpkins! I’m going to be making some similar from burlap and some from drop cloth. Can’t wait to show you how they turn out. I can’t wait to see them, Pam! Thanks for reading! !